It’s meta time! Our hint to the meta answer is “Which famous film director is hinted at by this puzzle’s theme?” Maybe the seven films in the longest entries will help us get to the solution. The films themselves do not seem to be related, but the title “Silent Films,” coupled with the two entries specifying there was more than one choice in those answers, point us towards the silent letters in each film title. We have DJANGO UNCHAINED (take the first silent letter), GONE WITH THE WIND, JOHNNY MNEMONIC (take the second silent letter), RISKY BUSINESS, WOULD YOU RATHER, A WALK IN THE WOODS, and CRAZY STUPID LOVE. The silent letters in order from top to bottom spell the last name of iconic filmmaker Cecil B. DEMILLE, who is our meta answer. Getting the meta may prove too easy for experienced solvers, but Evan’s goal is to make metapuzzles accessible to as many solvers as possible, and he does a fine job of it. It would have been nice for each entry to have only one silent letter, but DJANGO and MNEMONIC were my keys to solving the meta, so their presence makes up for having two silent letters in their full titles. 79a. 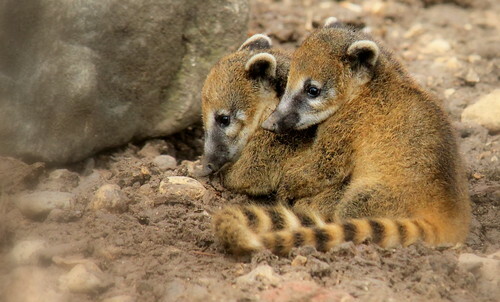 [Raccoon relative] COATI. OMG how cute. 102a. [Easter treats that puff up when microwaved] PEEPS. I am pleasantly surprised that this Peep Research website still exists. It brought me great joy in college. 116d. [Navel coat] RIND. Totally had LINT first. 65d. [OutKast, e.g.] DUO. So many good songs from this smooth delicious combo of André 3000 and Big Boi. Here’s a link to OutKast’s Rosa Parks, but feel free to explore their other work. 23a. [Fashionable enough for a runway model? ], STRUT-WORTHY. Trustworthy. 25a. [Assault involving a hatchet?]. TINY-AXE ATTACK. Anxiety attack. 64a. [Stories from bankruptcy court? ], TALES OF OWE. Tales of woe. Meh. Owe is not a noun, and anagramming a 3-letter word underwhelms. 68a. [Be too broke to take the bus? ], HAVE NO FARE. Have no fear. 82a. [“The king really wants to be around people right now”? ], MY SIRE LOVES COMPANY. Misery loves company. 112a. [Negative Nancy? ], DOWNER WOMAN. Wonder Woman. The theme felt a bit uneven while I was solving (some feeling words first, some at the end; anagrams to both 1- and 2-word results), but there presumably are not enough familiar feeling phrases that lend themselves to decent anagrammed phrases that have the feeling word in the same place. The fill is quite good. Lots of 6- to 8-letter fill without the hideousness that too often finds a way into 21×21 grids. Highlights: TOOTSIE, NOODGE, BIGWIG, SAKE BOMB, TOP FORM, MOM JEANS, WOOLITE. The spelling of SHERIF (49d. [Muslim official]) threw me off, as SHARIF is more familiar. As with a zillion words transliterated from other alphabets, of course, there are various acceptable ways to spell this Arabic word in the Roman alphabet. Once the solver realizes that all the theme answers begin with DIS- the solving becomes … less inhibited. Spellings change each time. Dis-homony? 23a. [Lady’s opposing view?] DISSENT OF A WOMAN (Scent …). 36a. [Pink-slip issuers?] DISMISSAL LAUNCHERS (missile …). 50a. [School that can no longer teach law?] DISBARRED COLLEGE (Bard …). 65a. [Scatter violins?] DISPERSE STRINGS (purse …). 84a. [Two things a bandit who collects Barbies has?] DISGUISE AND DOLLS (Guys …). That’s silly. Silly, but funny. Not that a bandit would have doll collection, that those would be the two identifiers. 9a [“China Doll” playwright] MAMET. 93a. [How the bad blood is advancing?] DISCORD PROGRESSION (chord …). 114a. [Shocked butler?] DISMAYED SERVANT (maidservant). 14a [“MTP Daily” channel] MSNBC, 80d [Auto buyer’s fig.] MSRP, 62d [Bowl game channel] ESPNU. SOS! 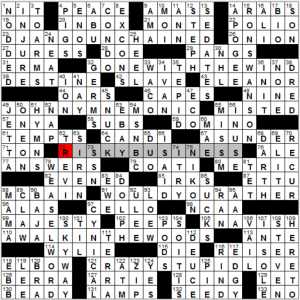 64a [Like 21 Across and 51 Down] GREEK. 21a [Alpha opposite] OMEGA, 51d [Pythagorean P’s] RHOS. Also, albeit less empirically, 44a [Star hunter] ORION. Miscellaneous notables (reasons not disclosed): 19a [Dull and then some] LAME SAUCE, 33a [Pentatonix’s label] RCA, 80a [Fuji’s one (abbr.)] MTN, 121a [Motel with a lot of stuffed animals] BATES, 45d [Producer Rubin] RICK, 86d [Globe schemer] IAGO, 101d [YouTube personality Dawson] SHANE. 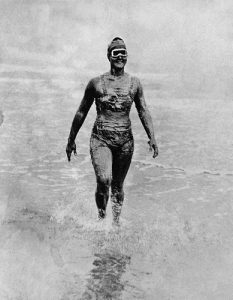 79d [Swimmer Gertrude] EDERLE, who’s basically crossword royalty. Alongside her, 90d [Swimmer’s gear] GOGGLES. 47a [Bread with dal] NAAN, 122a [Yucatan bread] PESOS. 7d [Dumbarton dude] SCOT, 17d Bonny hillside] BRAE. 37d [At heart] IN ESSE, [As a huge group] EN MASSE (Latin, French). 77d [Upbeat, as an outlook] ROSY, 100d [Pessimist’s outllook] DOOM. I first heard Personville called Poisonville by a red-haired mucker named Hickey Dewey in the Big Ship in Butte. He also called his shirt a shoit. I didn’t think anything of what he had done to the city’s name. Later I heard men who could manage their r’s give it the same pronunciation. I still don’t see anything in it but the meaningless sort of humor that used to make richardsnary the thieves’ word for dictionary. A few years later I went to Personville and learned better. Good afternoon, everyone! I hope you’re all doing well on this last Sunday of February. Speaking of finales, this is the last Sunday Challenge in the run of CrosSynergy. I’m definitely sad but also absolutely privileged to have had this part of my Sundays for the past three years. Today’s grid is brought to us by Mr. Randolph Ross, and it’s definitely BIG LEAGUE…and not bigly (1A: [In a major way]). 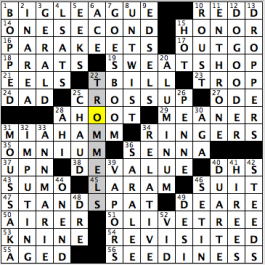 Definitely wasn’t too much of a challenge for me, and I knew that when I saw the clue to OMNIUM, something I’ve been waiting for for years to see in a crossword and finally getting the chance today (35A: [_____-gatherum]). Don’t judge, but I’ve only ever been in a Greek restaurant twice in my life and I never have eaten MOUSSAKA before (31D: [Greek restaurant order]). I’m not much of a lamb eater so I’m not sure how much I would like it anyway. Gotta give this grid a little more love with the soccer icon MIA HAMM in it (31A: [FIFA superstar]). You’re going to have to give me ONE SECOND before I go a little further in the grid, as I’m currently on assignment in Washington DC (14A: “I’ll be right there!”]). Want to give this blog a little more justice since it’s the last Sunday Challenge grid. Until then, read about a great person and driver who was taken from us far too soon. “Sports will make you smarter” moment of the day: SENNA (36A: [Medicinal plant]) – Billy Joel uttered the lyrics “only the good die young,” and that’s definitely true about one of the greatest (if not the greatest) open-wheel race car drivers of all time, Brazilian Ayrton SENNA. Of his 161 starts in Formula 1 racing, Senna finished in the top three in almost exactly half of those races (80) and won 41 races. During qualifying of the 1994 San Marino Grand Prix, Austrian driver Roland Ratzenberger died from injuries suffered in a crash, the first F-1 driver to be killed during a race weekend since 1982. During the race, Senna, on the turn before the bend that Ratzenberger crashed two days earlier, also crashed, succumbing to his injuries. The charismatic Senna, who was a world icon and probably the most-beloved Brazilian sportsman who did not play soccer, was 34 years old. Two more days to go, people!! 25a. [Trendy tots’ footwear? ], HIP BOOTIES. Basing the themer on a single HIP BOOT is slightly off. 27a. [Tipsy tour members? ], HIGH ROADIES. I don’t know about you, but I reserve “tipsy” for alcohol and “high” for marijuana references. 45a. [Bakery products made with white chocolate? ], LIGHT BROWNIES. Technically, there are blonde brownies, and they may have real chocolate chunks in a golden substrate. Also, light brown is meh as a base phrase. 83a. [Complimentary hotel apparel? ], GUEST NIGHTIES. Not sure what guest night is. 98a. [“Check out those platters of candy and fudge!”? 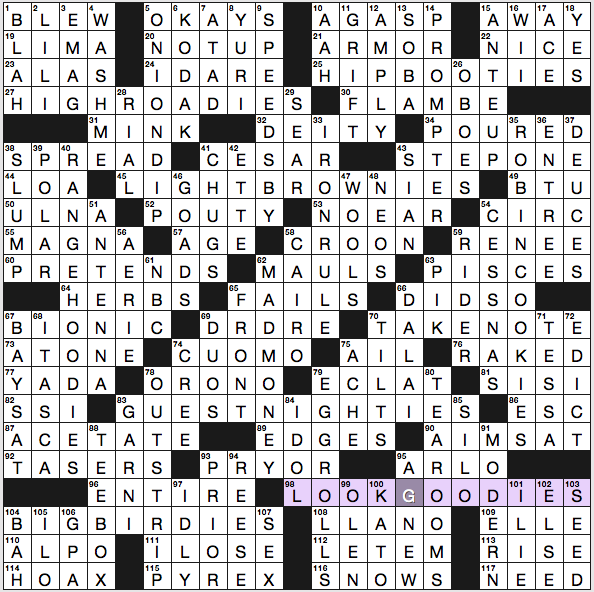 ], “LOOK, GOODIES!” All the other theme answers are noun phrases, so this one jars a bit. 104a. [Tournament-changing scores? ], BIG BIRDIES. 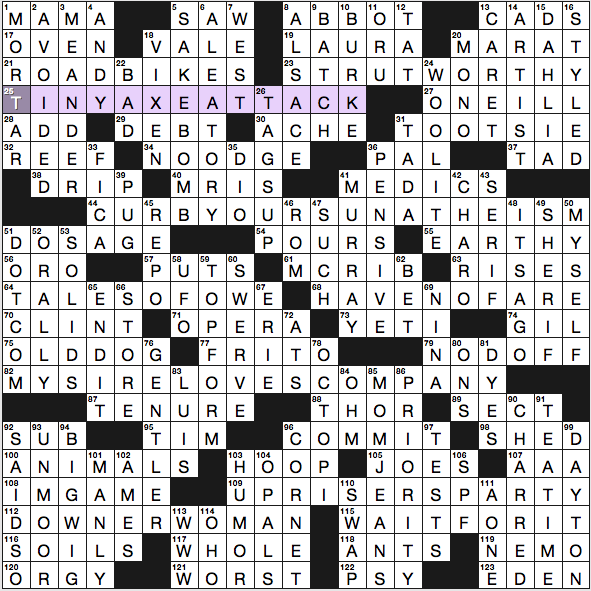 What, no mention of golf in the clue? The vast majority of tournaments are for sports other than golf. Would have liked a badminton birdies clue here. 35d. [Snacks Batman can’t have? ], ROBIN COOKIES. Those would be Robin’s cookies, though, in general. 40d. [Protective tops for cattle drivers? ], RANGE HOODIES. So the theme’s a bit spotty, in my book. 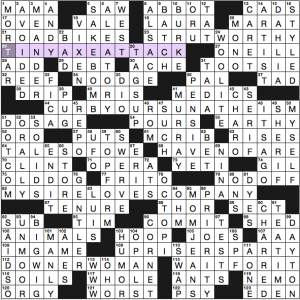 Least favorite clue: 59a. [Co-star of Keanu in “The Whole Truth”], RENEE. 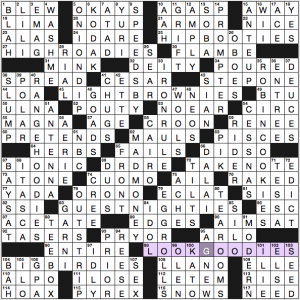 I edit pop-culture crosswords for a living. I subscribe to Entertainment Weekly. How did I miss this movie, I wondered. I checked at boxofficemojo.com after Wikipedia included a release date but no box office figures, and … I don’t think it had a theatrical release at all. I suspect 99.99% of solvers have never heard of the movie. People! Don’t just grab one of the most recent projects in a star’s filmography. Double-check that the movie might actually resonate with solvers! Otherwise you’re just including a flat-out obscurity. Least favorite answer: 53a. [Musical shortcoming], NO EAR. That … is not a thing, is it? I did like 33d: IRON RULE a lot, but overall I wasn’t enamored of the fill. 2.75 stars from me. This entry was posted in Daily Puzzles and tagged Brendan Emmett Quigley, Evan Birnholz, Gail Grabowski, Josh Knapp, Randolph Ross. Bookmark the permalink. Thanks, Erin. 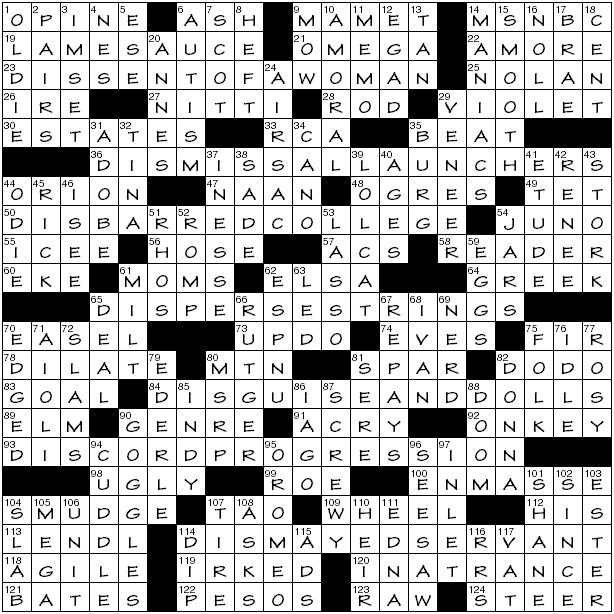 I too would have liked each movie title to have one and only one silent letter, but I’m not sure how easily I could have worked around that in a 21×21 puzzle. Originally I was thinking of making either CHAPLIN or THE ARTIST as the meta answer, but I’d bet I’d have run into the same issue even if I could have gotten a workable theme set. Using a silent P pretty much limits you to “Psycho” and “American Psycho,” and the H can probably be considered silent in those titles too. Silent R English words, outside of “February,” are pretty rare (and “February” is debatable). I probably would have had to go into French movie titles for that. Ah well. pannonica — Your “Dispossessed” array is funny. Ya can’t copyright a title. Right. I could write a book entitled Catcher in the Rye, or The Great Gatsby free of copyright issues. I loved the NYT anagrams. But Amy I don’t understand your criticism. Of course no one says uprisers. But I don’t see why the anagrammed transformations of familiar phrases (e.g. surprise party) should be “in the language” or intuitive expressions. 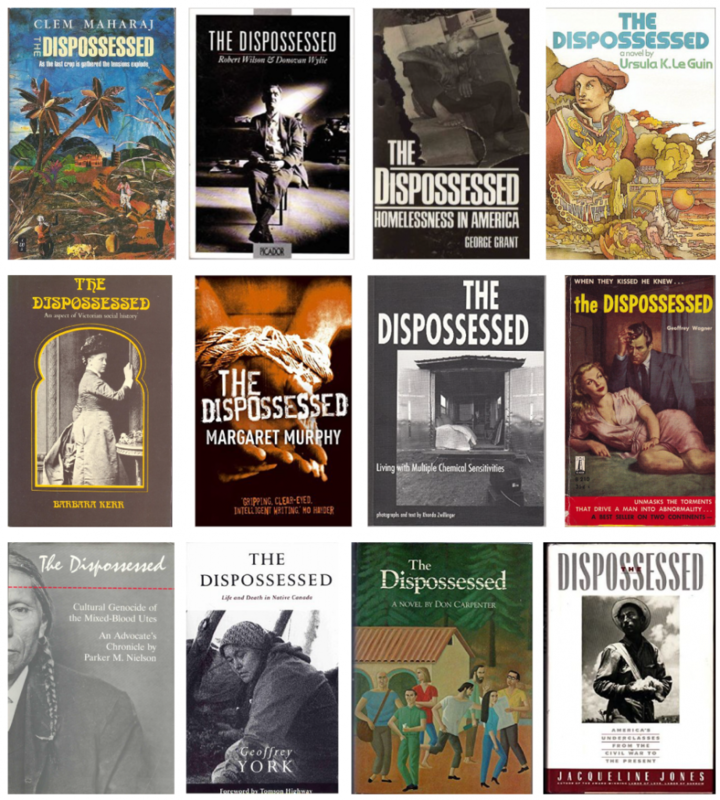 Coming soon: The Dispossessed and the Deplorables. To my mild SURPRISE, Google Books has several instances of UPRISERS “in nature”, but yes, it must be extremely rare; on Google Ngrams the line looks flat when plotted together with UPRISINGS. Curiously the plural is about as twice as common (or should I write “half as uncommon”) as singular UPRISER. 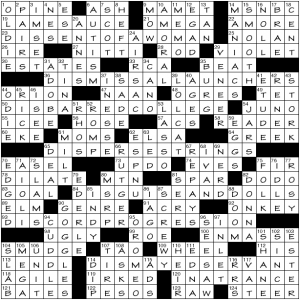 Where is the LA Times Sunday puzzle? Yes, Patti, where is it? We have been having a long list of problems with the LAT. Not only are we missing the LAT, this server is now refusing to post my question about it. What have I done wrong?